Jakarta,2018-The Asian English Olympics is back! This prestigious and mostly awaited English competition in Asia will finally return in February 2018. This year, The Asian English Olympics will adopt “Discover Your Extraordinary” as its main theme. The value of this theme is hoped to convey a message for Asian youths to step out of their comfort zone, get some experiences and discover their own meaning of Extraordinary in their life. They will never change their lives until they step out of their comfort zone and begin something different. The seventh Asian English Olympics will bring 8 competitions consist of Debate, Speech, Spelling Bee, Scrabble, Newscasting, Storytelling, Short Story Writing (online), and Radio Drama (online). To make it more challenging and exciting. The 2018 Asian English Olympics has invited some experts across Asia to judge and train the participants to give them guidance before the competition begins. So, the participants who had never experienced the competition before will be able to gain their confidence and compete in this Olympics. In 2017, The Asian English Olympics has invited a lot of spotlights, especially at some universities in Asia. 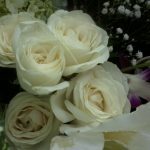 The seventh Asian English Olympics is brought back to continue the success of The Asian English Olympics. The 2017 Asian English Olympics has been joined by more than 600 people around Asia such as; Indonesia, Singapore, Thailand, South Korea, Philippines, Malaysia, Vietnam, Hong Kong, Macao, India, Bangladesh, Laos and many more. 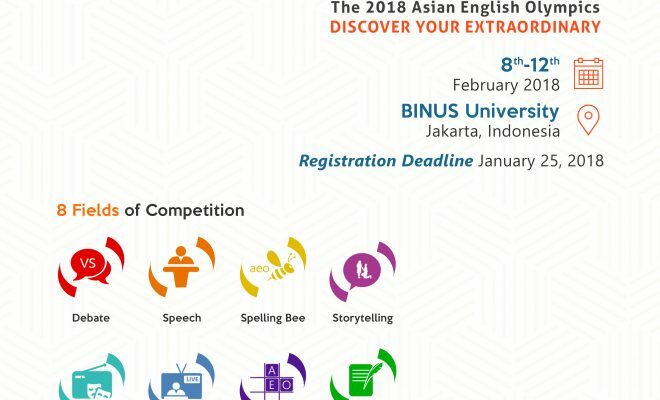 The 2018 Asian English Olympics will be held in Jakarta on February 8th – 12th 2018 in Binus University-Kemanggisan Campus. This event is not an ordinary competition, instead, it will be filled with much other fun and intriguing activities within. Some of the programs which will fill the excitement are The Opening of The 2018 Asian English Olympics, The Coaching Clinic, The Breaking Announcement, and also The Closing Ceremony of The 2018 Asian English Olympics. The fun events and also the challenging theme of The 2018 Asian English Olympics will hopefully remind everyone that life will truly get so much interesting when they step out from their comfort zone and we welcome you to this mostly awaited English competition in Asia! If I have never participated in any competition, is it possible if I joint with this English Competition?